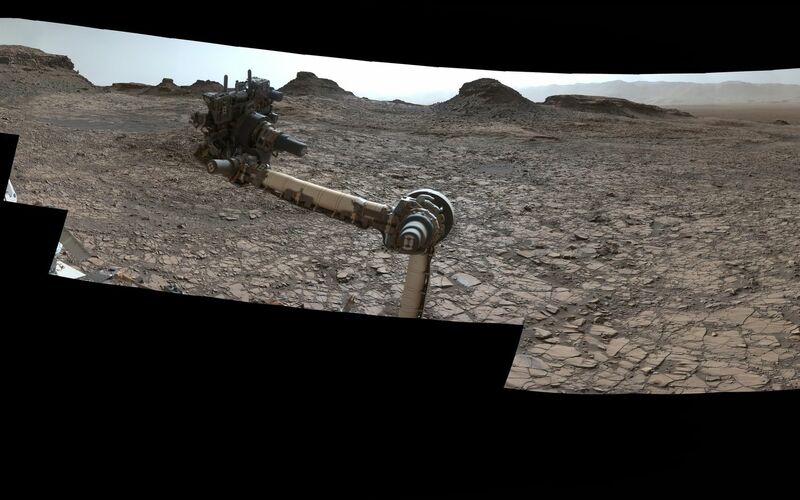 This 360-degree panorama was acquired by the Mast Camera (Mastcam) on NASA's Curiosity Mars rover as the rover neared features called "Murray Buttes" on lower Mount Sharp. The view combines more than 130 images taken on Aug. 5, 2016, during the afternoon of the mission's 1,421st sol, or Martian day, by Mastcam's left-eye camera. This date also was the fourth anniversary of Curiosity's landing. 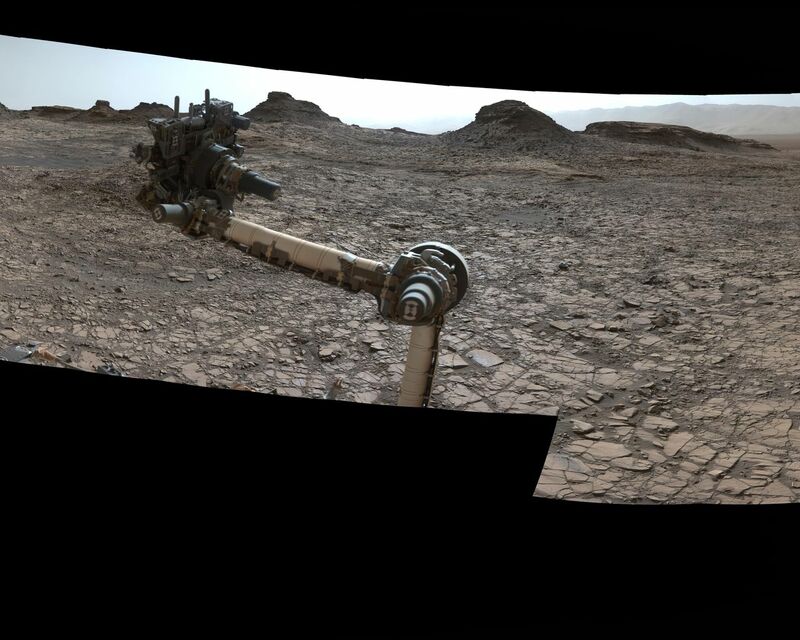 The dark, flat-topped mesa seen to the left of Curiosity's robotic arm is about 300 feet (about 90 meters) from the rover's position. It stands about 50 feet (about 15 meters) high. The horizontal ledge near the top of the mesa is about 200 feet (about 60 meters) across. An upper portion of Mount Sharp appears on the distant horizon to the left of this mesa. The relatively flat foreground is part of a geological layer called the Murray formation, which formed from lakebed mud deposits. The buttes and mesas rising above this surface are eroded remnants of ancient sandstone that originated when winds deposited sand after lower Mount Sharp had formed. Curiosity closely examined that layer -- the Stimson formation -- during the first half of 2016 while crossing a feature called "Naukluft Plateau" between two exposures of the Murray formation. The buttes and mesas of Murray Buttes are capped by material that is relatively resistant to erosion, just as is the case with many similarly shaped buttes and mesas on Earth. The informal naming honors Bruce Murray (1931-2013), a Caltech planetary scientist and director of NASA's Jet Propulsion Laboratory, Pasadena, California.